The executive would like to send a final ‘Thank you!! 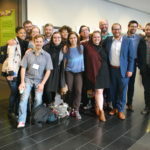 !’ to all those who helped make CANSEE 2017 our best conference, yet. It wouldn’t have been possible without the hardwork and dedication of all the volunteers, speakers, and attendees. Thank you, and watch the CANSEE newsletter for upcoming publishing and dissemination opportunities related to conference presentations. Our goal going forward is to give a hard push on our communications so we can grow CANSEE and support the expansion of ecological economics in Canada. Congratulations to David Mallery our student presentation award winner! Dave did a number of presentations at CANSEE2017 focused broadly on systems approaches in ecological economics. Dave is an E4A student in the climate justice cohort and a PhD Candidate at York University. He holds a BAH in Political Science from the University of Guelph, a Masters in Environmental Studies from York, and a graduate certificate in Environmental Security from the United Nations Mandated University in Costa Rica (UPEACE). We would like to welcome a new executive to CANSEE. Vijay Kolinjivadi will be taking over the VP- Education & Research role for the next term. We’re very excited to welcome Vijay on board. Michelle Molnar stepped down as president, and previous conference chair Jerome Dupras has taken her place. Jerome’s management of the CANSEE2017 conference was incredible and he will bring great energy to the president position. Lynda Gange and Katie Kish remain on the board as secretary/treasurer and VP-Communications, respectively. Can We Stop the Advance of Climate Change While Growing the Global Economy?